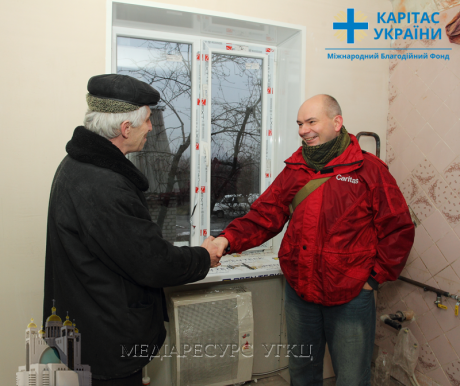 On early September 2014 Caritas Ukraine started the project of windows installation for nearly 1000 apartments and private houses in Slovyansk and its suburbs. Additionally windows in local school and kindergarten were installed. The main objective of this initiative is to restore safe and dignified life of people affected by military conflict in the region in summer 2014. The project is going to the end and we are talking with Valentyn Bebyk, Project Coordinator, in order to learn more about liberated city and mood of its inhabitants, about needs of internally displaced people and future plans of local Caritas team. We arrived to Slovyansk just after its liberation from terrorists, when more than ten thousands of inhabitants have left the city because of war. We definitely knew why people were afraid to return home: if your house is destroyed you are homeless in your native city. Numerous charitable organizations worked in the city providing people with food, clothes, even reasonable money allowances – but nobody put his hands to the restoration of houses. How did you select the beneficiaries? In autumn we spent up to two months to create the high-quality databases of potential beneficiaries and to generate appropriate package of legal and financial documents. In addition we had to organize tenders for purchase of glass and window systems. It was very important for us to use donor’s money in the most effective way. When country is in war every penny spent for help for people in need is extremely valuable. How big is project team and why you selected this people? 13 people are working in the project. In the process of selection the emphasis was made not only on professional competency but also on personal skills, such as capability to handle stress, mobility, teamwork ability and high level of dedication. That’s why community activists, volunteers, who helped in evacuation of the city, joined our team. And we really are as a whole, we spend together even free from work time. How did you managed to change the city? We managed to help about 80% of the people in need from Slovyansk and suburbs - disabled, people with large families and/or low-income. Some people rebuilt their homes by themselves, were helping their neighbors. Disaster brings people together in a special way. How did you start your work in Slovyansk? From the very beginning of anti-terrorist operation (ATO) in Eastern Ukraine Caritas Ukraine concentrated its activities on providing assistance to people in need from Donetsk and Luhansk regions. We provided more than 15 000 people from Slovyansk and Kramatorsk by more than 110 000 tons of drinking water. We bought disinfectants for schools and hospitals in Slovyansk, provided toiletries, medicines, equipment for geriatric boarding house in Donetsk. We procured diapers, warm clothes, hygiene kits, blankets, sets of school supplies for children, laundry detergent and laundry for internally displaced persons living in Svyatogirsk. How is Slovyansk looking now? What is the emotional condition of its citizens and in general in the part of Donetsk and Luhansk regions affected by war? Definitely before 2014 this city wasn’t as crowded as now. Despite the fact that about 60,000 people have left the city already because of occupation now city life is much busier. In fact the city is crowded, there are more than 20,000 registered internally displaced persons, a lot of military men are based here as well as all major humanitarian missions are working. During last weeks people evacuated from Avdiivka, Popasna, Debal'tsevo, Vuhlehirsk are arriving to the city. Why do people continue to live in cities where there is so big danger for their lives? First, young or middle-aged people, who have better chance to adapt to the new city, to find the way how to earn money for their families, left the frontline area long time ago. Or they are in separatist’s army. In the cities you mentioned people live mostly in shelters. These are women with children, pensioners, disabled. Second, the question of relocation (or in worst case – evacuation) is significantly associated with self-awareness. If the people dedicated all their life for acquiring of certain wealth and building of their own homes – they are panic to leave all their earnings. They are ready to stay in home till the last moment, even when they need to live in the basement for months. If the war will end tomorrow, what will be the main stabilizing factor for the region? We, Ukrainians, are the one family, together with people from Transcarpathia, Donbas, Lviv, Odesa, Kyiv, Volyn. All of us are different; we have diverse historical past, education and cultural background. But we are one nation. And if we want to have the prosperity in the future, we need to help other family members. Personally I consider that education is the most important factor for stabilization of situation on the East.People need to learn history, language and culture to widen their word. When the person is well educated, when he visited many countries and has numerous acquaintances – he cannot be manipulated in the easy way. We really changed in 1991, then was 2004, now 2014… These are the complicated processes which unfortunately require significant changes and losses. But this progress, I'm sure. Slovyansk will not allow anymore the situation that happened here last year. How close to conflict zone are you and your team ready to work? For me personally it’s not a problem to work directly in conflict zone where people need maximum of assistance. Now and later I’m ready to work for people’s sake even if their political views do not coincide with mine. Human being in crisis and his needs are on the first place for us, all other is second-rate. As for our team - we are like-minded. To work in Caritas means not only have technical duties for receiving salary, it is our civic position and life credo. Who funded the windows installation in Slovyansk and why? Why? Renovation of Slovyansk as any other city liberated from terrorists means creation of opportunities for tens of thousands of people to return to their home places. It's simple. It is also a boost for the community and the government to mitigate the destabilizing impact of the conflict. This project was made possible thanks to supports of US Agency for International Development. The initial budget was 3 mln hryvnias (240.081 USD). Additional financial support came from Caritas Austria in amount of 30 000 Euro – especially for installation of windows in kindergarten ‘Rushnychok’, sport schools and other educational establishments in Slovyansk.